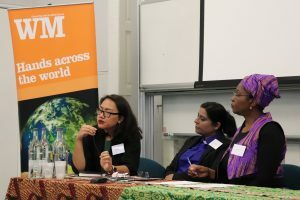 I was invited to respond to Professor Kwok Pui-lan’s paper, and share about being a woman in the Zomi church. Professor Kwok highlighted the somewhat contradictory nature of freedom that many missionary women experienced. She noted that although mission work allowed women to have a profession, they were still nonetheless working within the confines of set gender roles and Victorian notions of domesticity. Their work was ‘woman’s work’, and they received low wages if any. For me, as a Zomi woman, her remarks reminded me of the current situation of many women in my community. The Zomi are an ethnic minority group from north-west Burma. Christianity was introduced by American Baptist missionaries in the late 19th century and today, around 80% of Zomi are believers. For the Zomi, the church is not only a place of worship but a centre of the community. It is microcosm of Zomi society, which unfortunately means that it also reflects the sexism and patriarchy still sadly prevalent. I shared two observations – firstly, the unappreciated and often overlooked work that many women do and secondly, the negative attitudes about that work. In both Zomi church and society, there is a gendered division of labour, where women are expected to cook, cleaning, decorate, serve food and look after the children. While in most denominations, Zomi women are not forbidden from ministry, (they may preach and teach) ordination is generally limited to unmarried women only. Furthermore, these tasks are seen as lesser, or more menial and trivial. The Zomi refer negatively to domestic tasks as ‘Martha nasem’, meaning ‘Martha’s work’. Martha of course, being criticised for prioritising her hostess duties over listening to Jesus. This idiom reveals the prevailing but incorrect notion within Zomi churches that ‘true’ service consists only of preaching, leading the worship, or teaching. This idea that only certain roles in the church are ‘true’ or ‘significant’ ways of serving is incorrect. We are all one body in Christ – a body that is made up of many different parts, each necessary for the whole. It is therefore mistaken to consider one act as less worthy, or necessary, as another. Additionally, we must also problematise the idea that cooking, cleaning, serving tea and coffee etc. is ‘women’s work’, that only women should serve in this way. Not only is this sexist, it is also a far cry from God’s intention for his people. As a church, we are called to be God’s kingdom here on earth. If we, as Christians and as churches, reflect the ills of society, we are not fulfilling our God-given task of being salt and light. It is not enough to fight for women’s ordination and content ourselves with that. We must duly recognise the value of contributions made by women at all levels of church life, while at the same time, be wary of implying that such work is for women only. To fight for gender equality in the church is to fight for equal dignity and respect for all women in whatever positions they serve. My fellow panellists included Rev Dr Nosheen Khan from the Church of Pakistan, and Professor Isabel Phiri, the Associate General Secretary for the World Council of Churches for Public Witness and Diakonia. Dr Khan spoke about her experiences as a woman in the Pakistani church, detailing some of the struggles she faced. An important point that she raised concerned the battleground of the fight for gender equality. In Pakistan, the battle was being fought on a cultural level, not a legal one. Although women legally had equality under the law, or at least, some measures of protection from blatant discrimination, there is still at present a culture of sexism, discrimination and devaluing of women. This occurs on a cultural/social level, making lasting change very difficult. Dr Khan’s point highlights the two-pronged nature of sexism – for patriarchy and institutionalized sexism to exist, there must also exist a culture where such prejudice is allowed. Her observations urge us to continue to fight not only for institutional or legal change, but also cultural. Professor Isabel Phiri shared a few reflections from her work with the WCC. Her work focuses on generating productive ecumenical debate and action concerning, among other things, ending gender-based violence, children’s work and health and healing. Prof. Phiri spoke briefly of how too often, she has seen gender justice compromised in order to maintain unity between churches. She also spoke of the misuse of biblical verses (such as 1 Cor 11:3) to justify violence and discrimination against women. Her observations highlight the unavoidable fact that there are some areas in the struggle for women’s equality where it may be necessary to draw a hard line, or take up a position which we are committed to defending. Often, drawing such a line will necessitate a difficult navigation between ingrained cultural practices and biblical truths. While this is certainly no easy task, it is something that is critical, if the church is to be a strong prophetic voice that calls for the equality and dignity of all people of all genders and sexes. 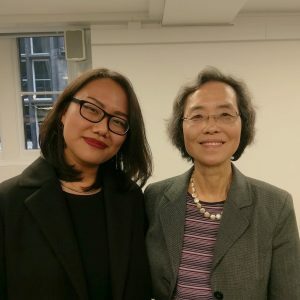 For more about the ‘Women and World Church’ conference, you can see the keynote Alexander Duff lecture given by Professor Kwok Pui-lan, entitled ‘Women, Mission, and World Christianity‘, or read about the second response panel authored by Centre student Lucy Schouten. This entry was tagged American Baptist, Burma, Christianity, Pakistan, Women, World Council of Churches, Zomi by Nuam Hatzaw. Bookmark the permalink. Nuam Hatzaw is a Masters student in World Christianity. She graduated from SOAS, University of London and her research interests include World Christianity, postcolonial feminist theology. anthropology, nationalism studies, and development studies.